How to make a dessert board for two for Valentine’s Day. 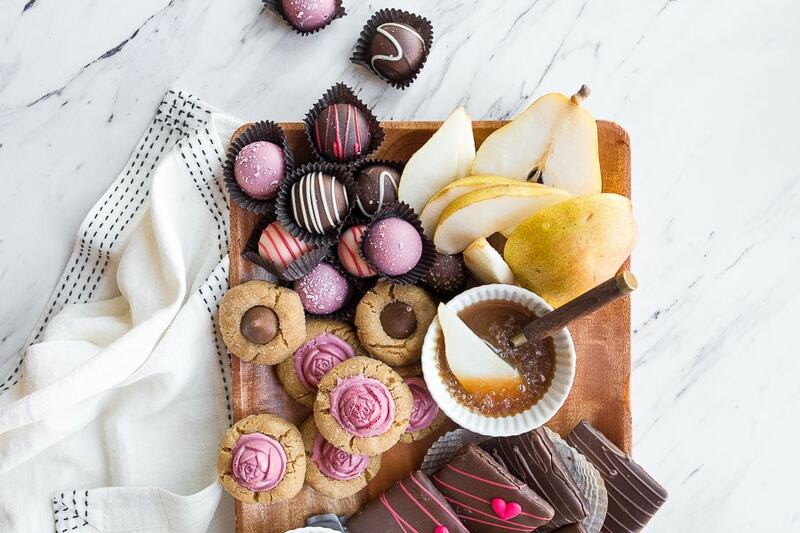 Such a sweet no-cook way to serve an easy dessert on Valentine’s Day. This post is sponsored by Harry & David; all opinions and work is my own. What kind of Valentine’s Day dessert do you make for the guy who has dutifully eaten all of the desserts for two over the past 10 years? The guy who’s offered recipe ideas, helpful critique, and taste-tested with the best of them–the guy who deserves the best of the best? When I asked my husband which dessert he wanted for Valentine’s Day this year, his eyes widened and he said he couldn’t pick ‘just one.’ He knows his answer must be something I’ve never made before, because yes, I’m going to make a blog post out of this. Life as a dessert blogger’s husband isn’t as glamorous as you might imagine. There is lots of delicious food involved, but hardly ever the same thing will be made twice! So, I made us a dessert board with all of his favorites. It leans heavily on chocolate, because it is Valentine’s Day after all. I have a few surprises tucked into this dessert board, and I can’t wait to share them with you. Our dessert board is a loving mix of our favorite store-bought treats and some homemade items, too. When you’re making a big dessert charcuterie board, it’s best to plan on buying some stuff and making only a few items. 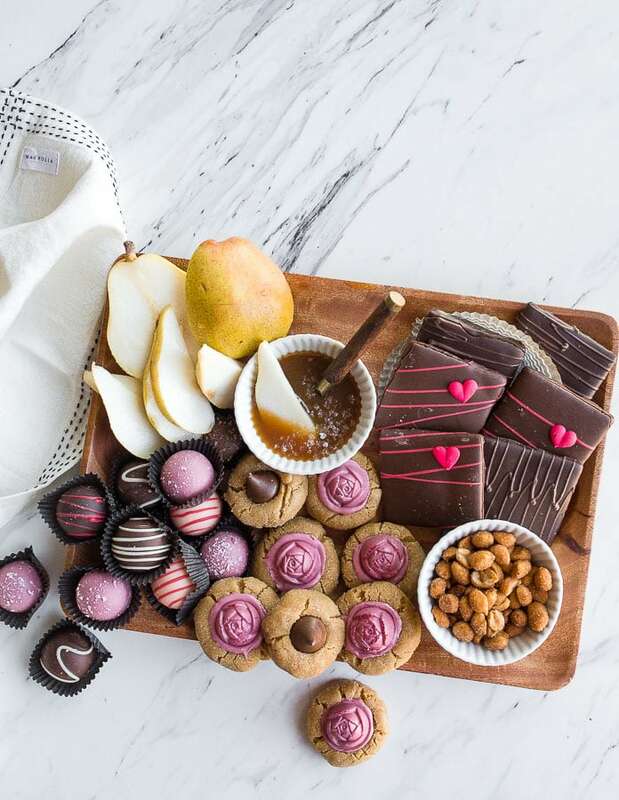 This is a small dessert board that is meant to serve two people, but you can absolutely scale it up for a girl’s night or a Valentine’s Day party! –1 fresh fruit with a sweet dipping sauce. We’re forgoing the typical chocolate-dipped strawberries this year in favor of pears dipped in salted caramel. It’s definitely an upgrade that we’re going to stick with! These are Harry & David’s sweet and juicy Royal Riviera Pears, of course. I used my homemade salted small batch caramel sauce for dipping the pear slices, and a big pinch of flaky Maldon sea salt for topping. You can absolutely buy a jar of your favorite caramel sauce instead. –assorted truffles in your favorite flavors. 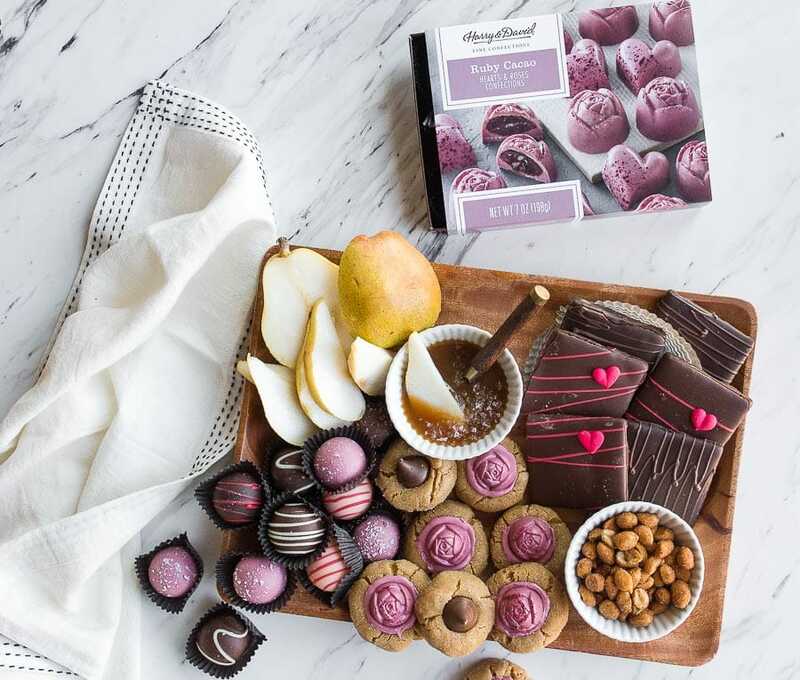 I opted for the big heart-shaped box from Harry and David, because it has the best mix of flavors: milk chocolate, dark chocolate cherry, crème brûlée, strawberry milkshake, rocky road, and their brand new Ruby Cacao Truffles. I’m drooling as I type this, and sneaking into the pantry for another bite! 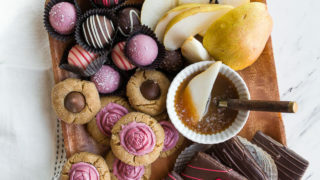 –a selection of chocolate-dunked goodies and other favorite sweets. On one of our first trips to Big Sur, my husband and I stopped at the Whole Foods in Monterey for road snacks. We discovered chocolate-covered graham crackers, and have been hooked ever since. 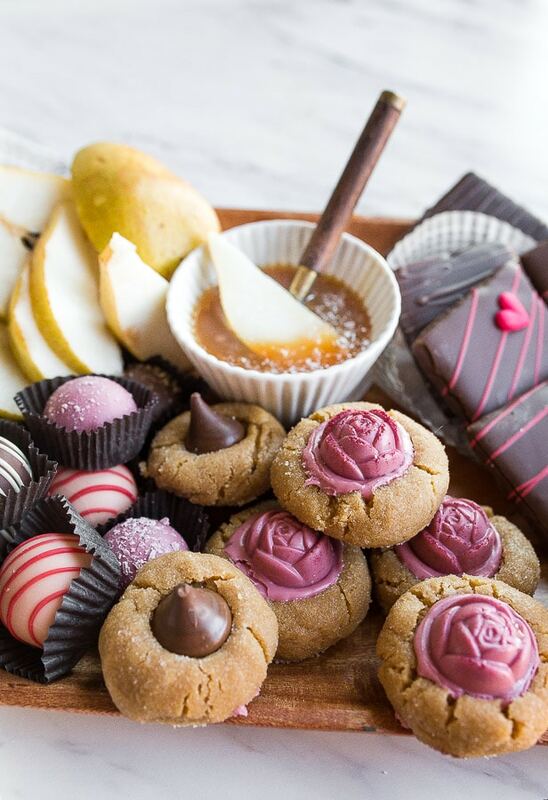 They deserve a special place on our Valentine’s Day dessert board. Our mutual love of honey roasted peanuts was probably honed on the hundreds of Southwest flights we took the first 5 years we lived far away from our families. This snack board holds so many fun memories for us. –one homemade item for the board. This is entirely optional, but I really think it adds something special to the board. In my case, my dessert board was missing my husband’s favorite flavor combo: chocolate and peanut butter! 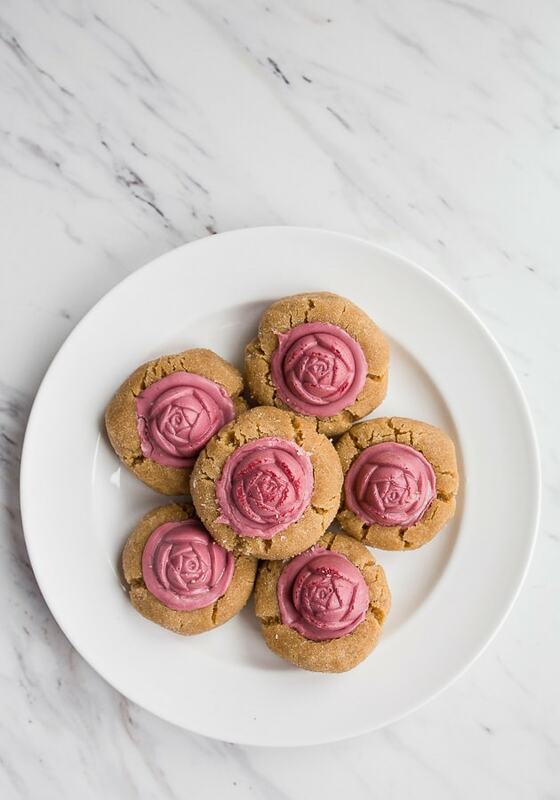 So, I made a small batch of peanut butter blossom cookies, and pushed the beautiful rose-shaped Ruby Cacao Truffles inside. 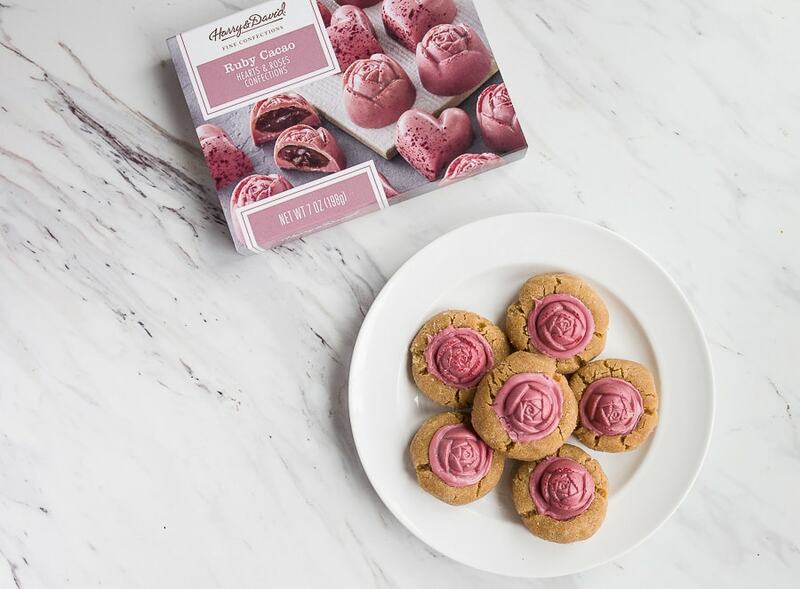 You’re probably wondering about my pink truffles on the cookies; aren’t they the prettiest? It’s called Ruby Cacao, and it’s actually a new product that is naturally pink! Hold the phones, we have an emergency: There is a new flavor in town! It’s quite possible that my time to be a mother to a pink-loving, ballerina princess daughter couldn’t begin until the ruby cacao bean was discovered. Let’s just say life is very good (and very delicious). Ruby Cacao Truffles have a subtle berry flavor. I love that the hue is totally natural, and I dare you not to instagram it! Are you guys staying in for Valentine’s Day, or are you doing the fancy dinner reservation thing? We tend to stay home, because our wedding anniversary is just a few weeks away. We usually do a homemade Valentine’s Day dinner for two at home, and a fancy anniversary dinner out. Plus, it’s much easier to get a dinner reservation any other day in February than the 14th, heh. 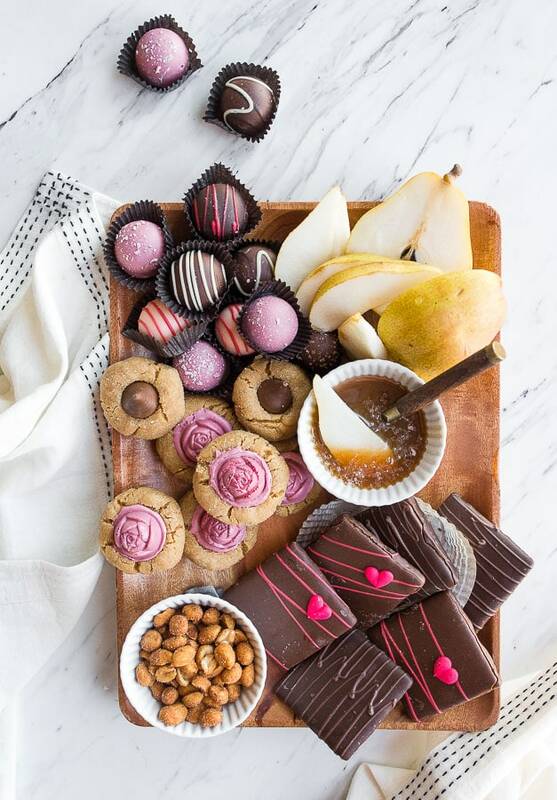 No matter your plans, I hope you’re inspired to make your very own dessert board for Valentine’s Day. Use my recipe index to find your favorite homemade items, and add luxury treats as you go! I have a collection of easy romantic Valentine’s Day desserts for two here, and I also have a list of romantic meals for two at home for the big day. 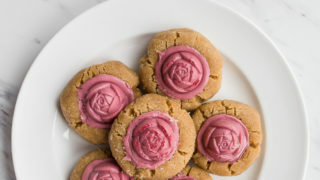 Adorable peanut butter blossoms for Valentine's Day made with rose shaped truffles. Preheat the oven to 375, and have a parchment-lined baking sheet ready. In a medium bowl, beat with an electric mixer on high the butter, peanut butter, and sugars. Beat until very creamy and light, about 2 minutes. Next, add the egg and vanilla, and beat until just combined. Finally, beat in the flour and salt until a soft dough forms. Refrigerate this mixture for about 15-20 minutes, until it firms up slightly. Have a small shallow bowl of sugar ready for rolling the cookies. Divide the dough into 12 equal-sized balls, and roll each ball generously in sugar before placing it on the baking sheet. Bake for 8-9 minutes, and then remove from the oven. 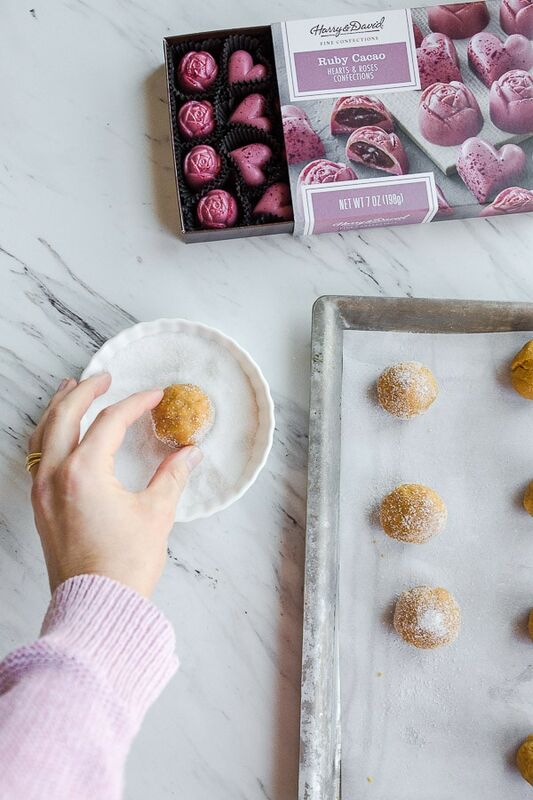 Press a truffle into the center of each cookie, and then move the cookies to a cooling rack to cool completely. 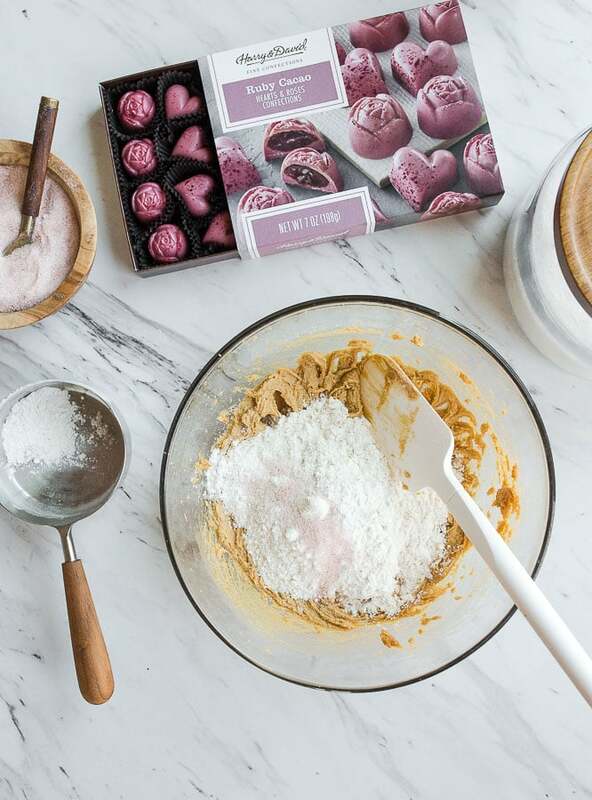 *I'm using Harry and David's Ruby Cacao truffles, but you can use regular kisses or other filled chocolates. Festive Valentine's Day sweet charcuterie board for two. 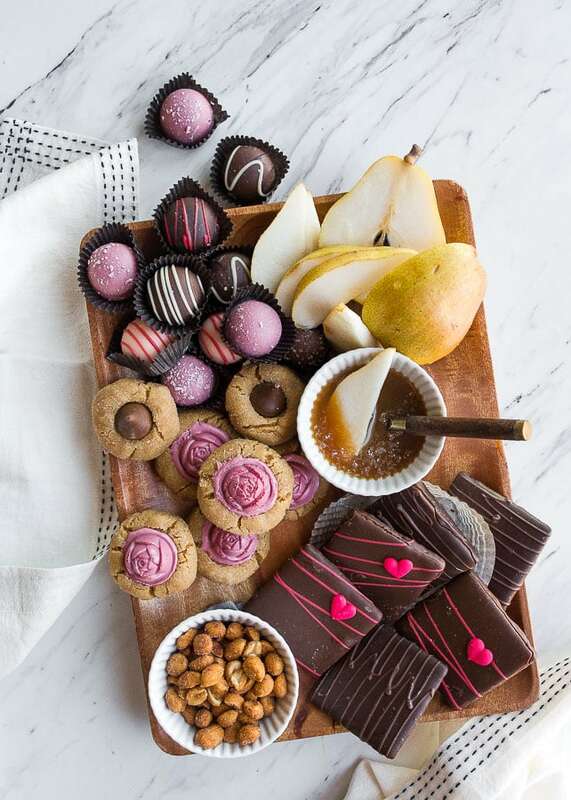 Arrange the truffles and chocolate-covered graham crackers (or other sweets) around a small board. Pour the caramel sauce into a small serving dish, and add a spoon. Place the peanuts into a similar serving dish. Arrange the cookies on the board. Finally, slice the pear just before serving, and place it next to the caramel sauce.